Christina O’Connor and Eddie Cantwell attended the Adopt a Monument Workshop and Networking Event with other members of the Adopt a Monument Groups from around the country on Friday last. The event took place at the Radisson Hotel in Athlone. Attending also were County Councils, Community Archaeologists and the Heritage Council. This was an opportunity for Adopt a Monument groups to meet and share stories about their sites and experiences. The presentations outlined the story of the particular sites and why they applied and were accepted as part of the Adopt a Monument scheme. 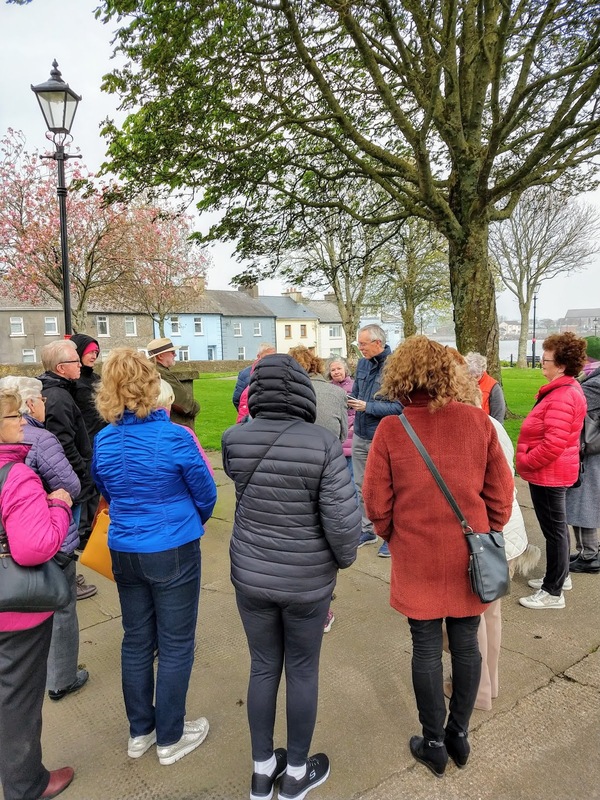 As part of the event, along with the other groups the Dungarvan group were asked to deliver a short informal presentation about their site, what they have achieved as part of the scheme and what their future plans are. The group’s achievements and what they hope to accomplish in the future were outlined by Chrissy who was first to speak and did the Museum proud with her talk on the Gallows Hill Project and what Waterford Community Archaeology: Gallows Hill Community Group have achieved to date. There were then round table talks with Heritage officers and Adopt a Monument personnel which took us into the late evening. On Wednesday last, April17th we had another walk to buildings and places of historical interest. William Fraher gave an introduction to the group in the museum before visiting the Dungarvan Town Park / Lookout / Swimming Pool and St. Mary’s Church of Ireland. A large group again attended and enjoyed the lecture. Our final walk will be on next Wednesday, 24th April to St Mary’s Parish Church. It will begin as usual at 3 p.m. in the museum where a brief introduction will be given before setting out on the walk. Check on our Waterford County Museum website, Facebook and in local papers for further talks in the future. National Drawing Day organised by the National Gallery of Ireland takes place on Saturday 18th May 2019. Waterford County Museum are delighted to be part of this nationwide event. Children’s Drawing Workshop: 11 – 13.00 p.m. Please note this is limited to ten and places must be booked in advance. A Talk by artist A. C. Hayes - Different Approaches to Drawing – Klee, Halbine, Solle Witt, Hockney: 1.30 – 2 p.m.
Curator William Fraher will give a guided tour of pictures currently on display in the museum and explain their history. 2 – 2.45 p.m. Adult Drawing Workshop: 3.15 – 5 p.m.
Limited to 12 places which must be booked in advance. 'Anastasia Handlon and Margaret Curtin were indicted for stealing on the 21st of January, 21lbs weight of wool at Clashmore, the property of Major Dent. Mr George Q.C. stated the case, which was one of plucking wool off the sheep's backs from the effects of which the animals died. Michael Magrath - I know Major Charles Dent; I was his Shepherd in January last. On the morning of the 22nd I went out to look after the sheep, and saw ten of them were plucked...one of them died in a few days. In eight or nine days after I went to Dungarvan, and saw a quantity of wool with Constable Hearn, black, white and grey. I examined the wool and am able to say that is the wool that was taken from the sheep's backs'. Patrick Healy, Mr Dent's steward corroborated Magrath's evidence. The court heard that the two women were assisted by John Curran, Thomas Cremin, John Hearty, Margaret Handlon and John Kirby. 'Catherine Dee servant to Mrs Cremin at Abbeyside, proved that the prisoners sold 29lbs of wool to her at 6d a lb. Her mistress paid ten shillings at the time, and next day 4s and 6d. On hearing afterwards that the wool was stolen she gave it up to the police. Mr Triphook, Governor of the county jail, stated that the two women had five previous convictions and they were sentenced to 18 months. Can you identify the people and place in this photo? If so please let us know. A man named William Carroll, national schoolmaster at Ring, whilst drunk in Dungarvan on Saturday night last, made use of seditious language in the public streets, shouting at the top of his voice for the Fenians, that [James] Stephens was in Ireland, and that he knew it, and that he has a Fenian himself. This misguided fellow was cautioned several times to desist from using such expressions and to go home , but the more he was cautioned the more he showed his determination, until at length he was arrested by the constabulary, and brought before Captain W F Barry, R.M., who committed him to the bridewell, for further examination. I am informed he has a wife and four children depending on him, and he must be a very foolish man to remain in town conducting himself in so bad a manner amongst the peaceable inhabitants, who never sympathised with this deluded and misguided class of persons, whose object is not national but freedom spoilation, plunder, and destruction.